As the world market leader in the design and supply of passive roll damping tanks Hoppe provides a large variety of tailor made solutions for all kinds of merchant ships and offshore vessels. Roll damping tanks use a hydro-dynamically controlled flow of liquid within a specially designed tank, generally filled with ballast water, to create a stabilizing moment opposing the wave moment that is causing the ship to roll. The amount of stabilizing moment created depends on several factors, such as size and location of the roll damping tank, as well as hull form and loading condition of the particular ship. At Hoppe experienced Naval Architects individually design each roll damping tank for each specific application. In order to verify the performance scaled model tests of the particular tank under realistic sea conditions are undertaken. Our more than 3,000 installations have been proven to be the most effective in the market for more than 60 years. With the acquisition of FLUME® Stabilization System (present in the market since 1957) and Intering (present since 1969) Hoppe allocates the experiences of decades of know-how in the form of design, data and employees of the former two major players in the passive stabilizer market. In addition, the company is constantly developing the technology further using state-of-the-art simulation and testing equipment. FLUME® is a passive free surface open channel box type roll damping tank. It has the unique ability to adapt to changes in the vessel’s loading and operating condition. The stabilizers’ natural response period can be adjusted by a liquid level variation to match the corresponding roll period of the ship. 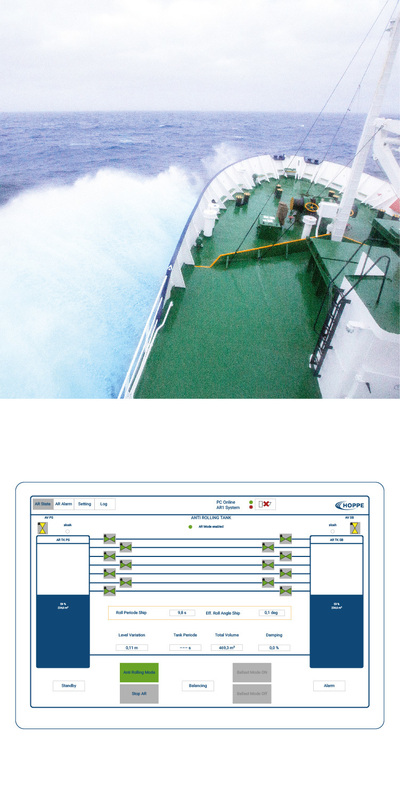 Equipped with a Liquid Level and Roll Period Indication System that constantly monitors the operating condition of the vessel and the stabilizer the system assists the crew in achieving the maximum roll stabilization. As an add-on, the system can be upgraded with a designated pump to adjust the liquid level in the tank automatically, therefore no interaction of the shipboard personal is required. 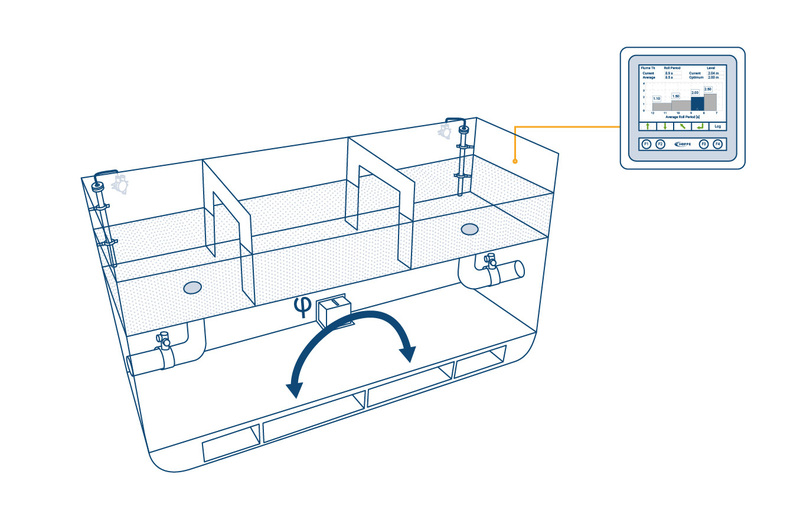 The FLUME® Roll Damping tank is especially suitable for vessels with a very large variance in loading conditions. As it has no moving parts maintenance and initial installation cost are relatively low. The U-Tank Roll Damping system uses a passive free surface U-tube type roll damping tank. The stabilizer consists of two wing tanks interconnected via a crossover duct either through or above the double bottom and a closed air duct system including remote operated valves. Hoppe offers different types of U-Tank Roll Damping systems. The difference is the control algorithm to adjust the natural response period of the stabilizer. The response period can be either adjusted by a variation in air damping, the crosssectional area of the water duct (Hoppe concept) or by delaying the fluid flow (INTERING concept). Equipped with a monitoring and control system which automatically adjusts the response period of the stabilizer it can be operated safely and at maximum efficiency in all operating conditions. The air-damped U-tank is the most cost effective solution applicable for vessels with a relatively narrow band of variation in loading condition. 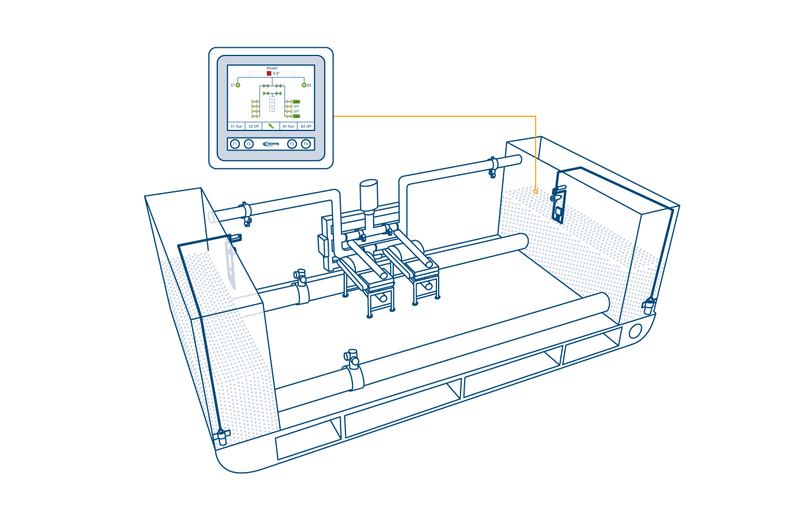 For the INTERING system Hoppe provides only maintenance, services and upgrades.